Our dogs come first. They are the centre of why we do what we do. As a registered not-for-profit rescue society, the safety, well-being, and health of our adoptable dogs comes before anything and everything else. This means we do rigorous background checks, home checks, and follow-ups with every adopted dogs and foster dogs. Suggested our applicants first, before applying, check their local shelters for a potential FURever dog. We also have our potential adopters or fosters fill out and sign a legally binding contract, so that should anything change, they have to return the dog to us. Thank DOG I Am Out Dog Rescue Society dogs cannot be surrendered, sold, gifted, or otherwise given away to any other individual or organization. We re-home any dog that has been returned to us. Completed a home check for every single applicant and determined that they are allowed to have dogs in their home. If they are renters, we check with their landlords. If they are owners, we check with their strata council (if applicable). Every family must be present at the home check in order for us to determine the living situation and whether we can approve their application. Conduct follow-ups on the adopter or foster, in order to ensure the continued well-being of the dog. This is conducted by members of our team and we still know where each and every dog that we’ve placed is located. Two amazing seniors, Toby (10 yrs) and Molly (13yrs), both suddenly homeless and in rough shape. Both got a much needed hair cut, and Toby had 27 teeth pulled. They are on the road to recovery, but we need your help with vet bills along their journey. A Not for Profit Dog Rescue Organization whose mission is to rescue and re home as many dogs at risk as possible. All donations of $25 or more will receive a government issued tax receipt. 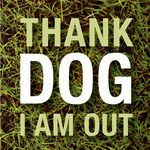 Thank Dog I Am Out is a not-for-profit rescue society based in Vancouver, BC. Our mission is to rescue as many dogs at risk of being euthanized, surrendered, abused, or neglected, and to place these rescued dogs into pre-approved fur-ever homes. Thank DOG I Am Out Dog (Reg Charity) has rescued sweet BLUE. A hound dog with many breaks in his front foot & leg, dental disease & arthritis. Sept 20th we will be amputating his leg PLEASE donate to our Feel Better BLUE Fund.